The second edition of an annual global summit on “artificial intelligence for good” spearheaded by the UN International Telecommunication Union opened today. A focus of the summit is how artificial intelligence can help advance the United Nations Sustainable Development Goals. The opening statements by UN heads, including the World Health Organization, showed growing interest in new technology to help in all kinds of areas such as health and agriculture. The AI for Good Global Summit is taking place from 15-17 May. An opening day ITU press release is here. The summit is organised in partnership with XPrize Foundation, “the global leader in incentivized prize competitions,” the Association for Computing Machinery (ACM), and sister UN agencies including” UNICEF, the UN Educational, Scientific, and Cultural Organization (UNESCO), UN Conference on Trade and Development (UNCTAD), World Intellectual Property Organization, World Health Organization, World Bank, and the UN Economic Commission for Europe, according to the ITU. While the 2017 edition was organised to start a global dialogue on the benefits of artificial intelligence (AI), this year’s edition is focusing on impactful AI solutions that can yield long-term benefits and help achieve the UN Sustainable Development Goals, the ITU said. ITU Secretary General Houlin Zhao, opening the summit, said the event is seeking to spur concrete projects. “AI is making its way out of research labs and into our everyday lives,” he said, with big data being a driving force. “This has serious implications for privacy and security,” he said, according to his speech. However, Zhao said, AI could help tackle humanity’s greatest challenges, such as increasing crop yields, managing natural disasters, and diagnosing health conditions. 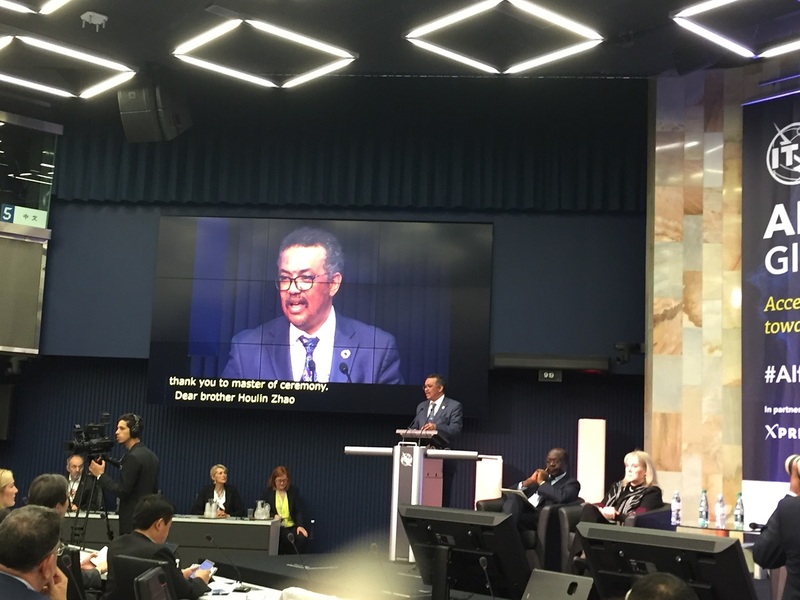 At the ITU, he added, “we hope that these solutions will help us connect all the world’s people” through the deployment of broadband infrastructure to those who need it the most. The objective of the summit, he said, is to connect AI innovators with public and private sector decisionmakers, so they can formulate strategies. He underlined the importance of the participation of multiple UN agencies, bringing “a wealth of expertise” to the debate. Beyond progress made in 70 years, he advocated for strong universal health systems and said WHO’s latest data showed that half of the world population lacks access to essential health services. He added the annual World Health Assembly taking place next week is expected to consider the 13th WHO General Programme of Work (GPW13), which lays out the WHO strategic plan for the next five years. GPW13 aims at having one billion more people benefitting from universal health coverage; one billion more people better protected from health emergencies; and one billion more people enjoying better health and well-being, he said, adding that digital technologies and artificial intelligence will be vital tools in achieving those targets. Digital technologies and AI provide a “wealth of tools that we did not have 70 years ago,” he said, citing telemedicine. Over 120 countries have developed digital health strategies, he said, adding that this number is likely to increase. “Collecting more and better data could see services tailored to people’s needs, leading to better health outcomes and better-performing health systems,” he said. The benefits of artificial intelligence are many, he said, citing AI being used to give paraplegic patients improved mobility, to make diagnosis faster and more efficient, and to develop new medicines and vaccines. UNCTAD Secretary General Mukhisa Kituyi warned against “scaremongers” who picture AI as being able “to create monsters which will shape what happens.” Humanity has always decided what technology should do, he said. He voiced several concerns, including inadequate skills development, and inadequate development of infrastructure. Some societies are talking about 5G when some others are struggling to get 3G, he said. There is a need to identify gaps in digital compliance, he said, and find solution to the lack of regulatory frameworks and privacy laws. Less developed and developing countries need to have a possibility of catching up, he said. Vicki Hanson, president of the Association for Computing Machinery (ACM), underlined the necessity for greater awareness of the new opportunities provided by technology. She said that it would be interesting to revisit problems which were deemed unsolvable with fresh eyes, as AI solutions for urgent challenges “may be hidden in plain sight.” Ethic issue in computing need to be addressed through both policy and public education, she said. "Artificial Intelligence For Good: 3 Days To Discuss AI Solutions" by Intellectual Property Watch is licensed under a Creative Commons Attribution-NonCommercial-ShareAlike 4.0 International License.